An impressive new series of definitive Albania stamps were issued at the end of 1913, and they all featured the portrait of Skanderbeg, the legendary hero of Albanian independence. The Principality (Kingdom) of Albania was established at the beginning of 1914, but with the advent of World War I, the new monarch abandoned his realm, and the nation was soon torn apart by a pan-Islamic revolution in central Albania and the Hellenic occupation of southern Albania. 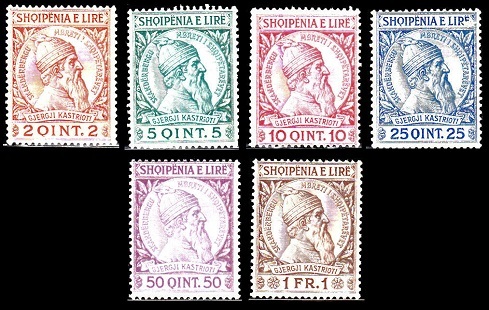 The six portrait definitive Albania stamps shown above were issued in December 1913. They are typographed and perforated 14. The common design features a helmeted portrait of Skanderbeg (1405-1468), attributed to the Austrian sculptor and medalist, Heinrich Kautsch (1859-1943). 02 Q. (1913 - Sc. #35) - Orange Brown & Buff. 05 Q. (1913 - Sc. #36) - Green & Blue Green. 10 Q. (1913 - Sc. #37) - Rose Red. 25 Q. (1913 - Sc. #38) - Dark Blue. 50 Q. (1913 - Sc. #39) - Violet & Red. 01 F. (1913 - Sc. #40) - Deep Brown. 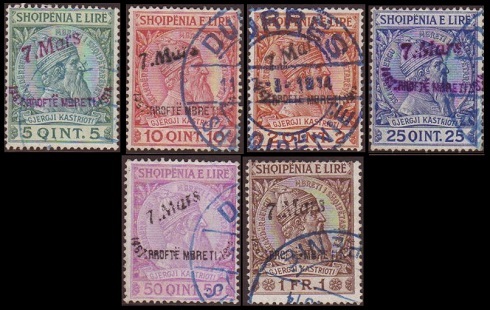 The six definitive stamps of December 1913 shown above were overprinted (by hand) on March 7, 1914 to celebrate the arrival of Prince Wilhelm zu Wied in Albania. The overprint reads "7 Mars / 1461 RROFTE MBRETI 1914". "RROFTE MBRETI" in Albanian means "LONG LIVE THE KING". The date "1461" refers to the life of Skanderbeg. The hand-overprint is usually in black or violet. 02 Q. (1914 - Sc. #41) - Orange Brown & Buff. 05 Q. (1914 - Sc. #42) - Green & Blue Green. 10 Q. (1914 - Sc. #43) - Rose Red. 25 Q. (1914 - Sc. #44) - Dark Blue. 50 Q. (1914 - Sc. #45) - Violet & Red. 01 F. (1914 - Sc. #46) - Deep Brown. In December 1913, the new stamps of Albania were denominated in Francs, with 100 Qintar being equal to 1 Franc. 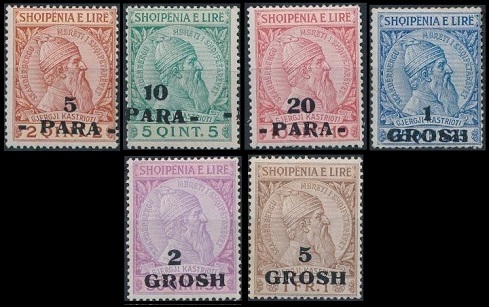 Beginning in April 1914, the currency used for Albanian postage stamps was changed to Grosh, with 40 Para being equal to 1 Piaster or 1 Grosh. This required the revaluation of the contemporary postage stamps to the new currency. 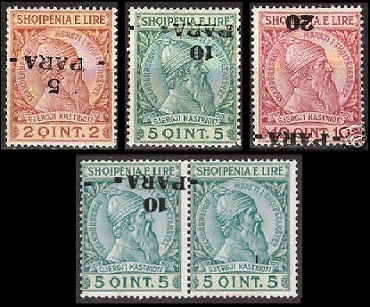 The six revalued definitive Albanian postage stamps shown above were issued on April 2, 1914. 05 Pa. on 02 Q. (1914 - Sc. #47) - Orange Brown & Buff. 10 Pa. on 05 Q. (1914 - Sc. #48) - Green & Blue Green. 20 Pa. on 10 Q. (1914 - Sc. #49) - Rose Red. 01 Gr. on 25 Q. (1914 - Sc. #50) - Dark Blue. 02 Gr. on 50 Q. (1914 - Sc. #51) - Violet & Red. 05 Gr. on 01 F. (1914 - Sc. #52) - Deep Brown. Single stamps with shifted overprints, inverted overprints, inverted partial overprints, and pairs showing missing overprints are relatively common. Some examples are shown in the image above. After World War I, Albania was a divided country, under French and Italian military occupation. It would not be until 1925, that Albania's original borders would be restored and that they would finally become a sovereign parliamentary republic. 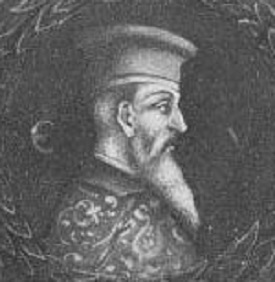 George Castrioti (1405-1468) was an Albanian nobleman and military commander. He served the Ottoman Empire from 1423 to 1443. The Ottoman Turks likened his military skills to those of Alexander the Great (356-323 B.C. ), and they gave him the title "Iskender bey" meaning "Lord Alexander". He often signed his name, in Cyrillic, as "Скендьрь бегь" or "Skender beg". Over the centuries, his title has been anglicized into "Skanderbeg". Between 1443 and 1468, Skanderbeg rebelled against the Ottoman Empire and fought to free his homeland from Ottoman rule. Though he also fought for the Republic of Venice and the Kingdom of Naples in their struggles against the Ottoman Empire, he always referred to himself as the "Lord of Albania". He has since been the symbol of the Albanian peoples' struggle for independence, and elsewhere in Europe, he has been regarded as the model of Christian resistance against the Muslim Ottoman Empire. 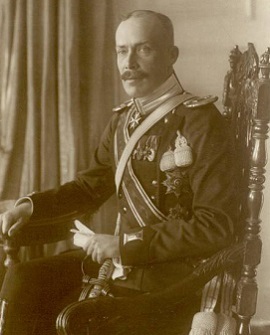 Wilhelm Friedrich Heinrich (1876-1945), of the House of Wied-Neuwied (German Empire - Rhineland), was a direct descendant of the Dutch monarchy, and he served on the General Staff of the Imperial German Army. He was selected by the European powers, in 1913, to become the new Prince of Albania, and his appointment was subsequently approved by the Provisional Government of Albania. He and his family arrived in Albania on March 7, 1914, establishing his capitol at Durrés. On February 21, 1914, Prince Wilhelm zu Wied (Albanian: Princ Vilhelm Vidi) was coronated as King Vidi I of Albania. His reign was of very short duration though. When World War I began, he was ordered to send troops to fight for the Austro-Hungarian Imperial Army. He refused, and on September 3, 1914, he fled into exile. He returned to Germany, where he later served in the German Imperial Army, on the Eastern Front, during World War I. The reign of King Vidi I officially ended on January 31, 1925, when the Republic of Albania was proclaimed. He never did return to Albania, and he died on April 18, 1945 in Romania, where he is buried.